The lid keeps conditions dark to delay sprouting, while perforations provide air for freshness. 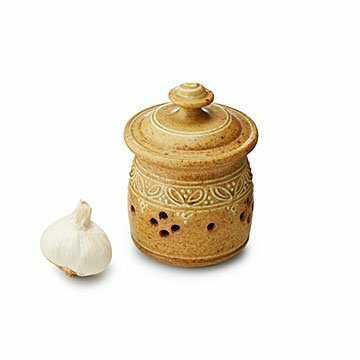 Keep your garlic fresh and flavorful in this charming stoneware container. The lidded jar holds three large heads of garlic in the dark to delay sprouting, while the decorative perforations provide just enough air circulation to ensure freshness. Karen and Stephen Steininger wheel throw, decorate with slip, and finish each piece with a warm, wheat-colored glaze for handcrafted appeal. Each one-of-a-kind container looks beautiful on your counter while it keeps your garlic in ideal conditions. Handmade in Altoona, Iowa. 6" H x 4.25" diameter; can hold up to 3 large garlic bulbs. I call myself a budget shopper however occasionally I like to treat myself. I spent a little more than normal on this garlic keeper BUT it is well worth the extra you pay. It is truly a beautiful piece of pottery.